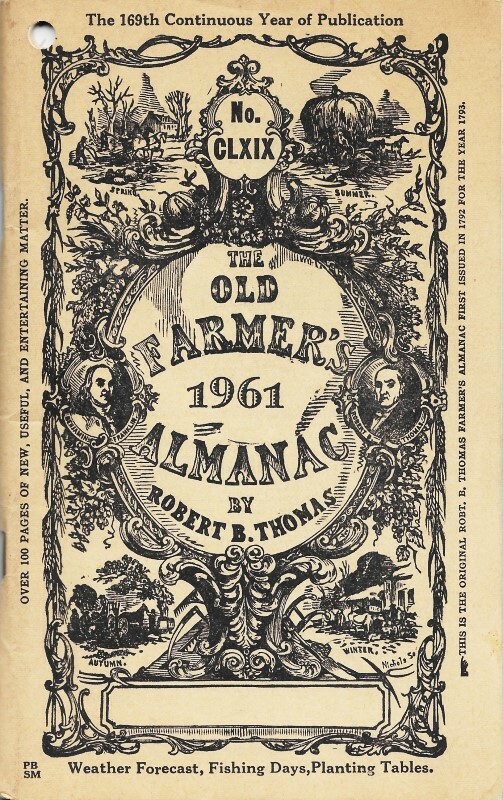 The Old Farmer's Almanac (OFA) has been on my annual need-to-buy list for as long as I can remember. 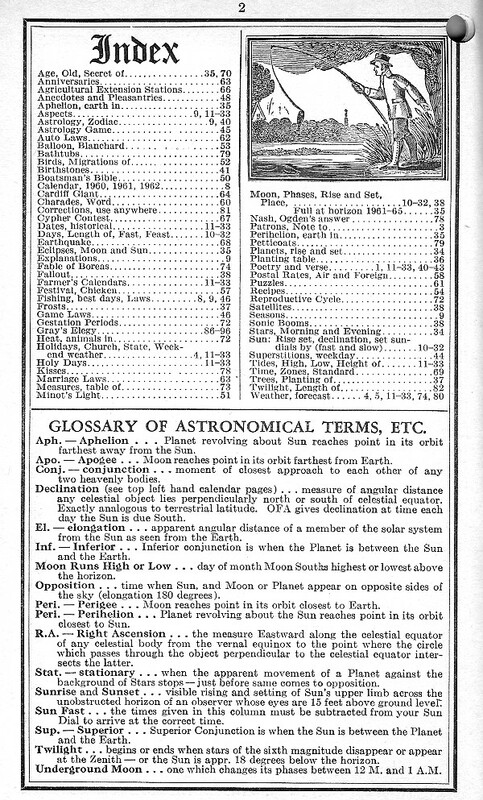 It is chock full of useful data for sunrise and sunset times*, high and low tide times, crop planting days, first and last frost days, and significant astronomical events. There are stories of interest on topics ranging from canning your garden's harvest to how to view a solar eclipse. - often from noted authors, but also from lay people. I also enjoy the monthly "on this day" type tidbits and the homey short story relating to the time of year. After 225 years of continuous publication, it still features the hole in the upper left corner to facilitate handily hanging it on the wall of your shed -- or outhouse. I gave a 1961 edition of the Old Farmer's Almanac found on eBay to Melanie as a birthday present this year. The format has not changed much over time. In fact, as you might suspect based on the 26,000-year precession cycle of the earth on its axis, the times of sunset and sunrise have not changed by even a minute since 1961. A few years ago the OFA stopped including a variety of mathematical and logical challenge puzzles, which I consider a dumbing down of the tome to spare the feelings of a new breed of readers. What has changed is the subject of articles addressing contemporary issues (of the day). 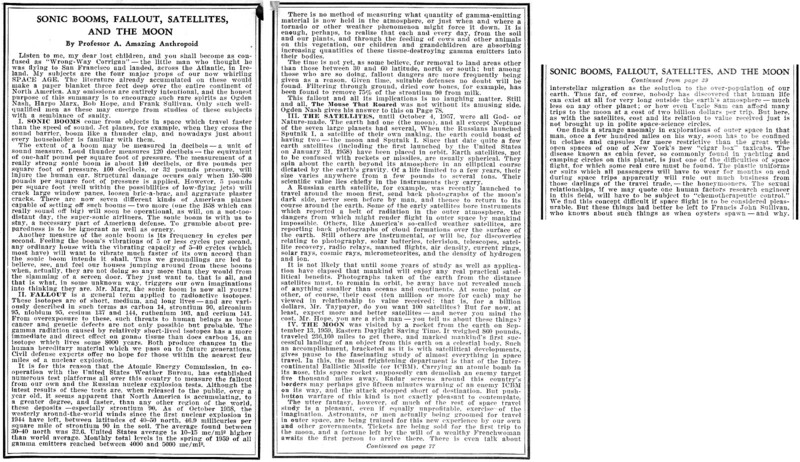 "Sonic Booms, Fallout, Satellites, and the Moon," reproduced below, is an example. The early 1960's were the height of the Cold War, when everyone was concerned with the potential for a devastating nuclear exchange. The only hostile entity with an atom bomb was the U.S.S.R. (Union of Soviet Socialist Republics); China didn't have one until 1964. Experts believe that Nazi (National Socialists) Germany would have had an A-bomb if not for its defeat in World War II. A lot of above-ground testing was producing airborne fallout (radioisotopes) that created measurable accumulation globally. As mentioned in the article, measuring stations were set up to determine the distribution. Supersonic aircraft, uniquely the realm of the military, were regularly creating annoying sonic booms that in mild cases just scared the bejeebers out of unsuspecting bystanders in their paths, and in severe cases broke plate glass windows and rattled dishes off of shelves. I vividly remember the days preceding graduation from the U.S. Naval Academy in Annapolis, Maryland, in the 1960's when the Blue Angles (F-4J Phantoms at the time) would fly practice almost right overhead at my boyhood home in Mayo and then we would wait anxiously for the boom. Satellites were of course a big item in the news as the Space Race ran coincident with the Cold War. Russia launched Sputnik four years earlier in 1957, with the U.S. Explorer 1 put into orbit in 1958. A whole new era of communications and, potentially, warfare, was in the making, and people were keenly interested in progress. With the dawning of manned space flight, it was 1961 when President John F. Kennedy stood before Congress and declared that the U.S. "should commit itself to achieving the goal, before this decade is out, of landing a man on the Moon and returning him safely to the Earth." We did, on July 20, 1969, with only five months to spare, when Apollo 11 astronauts Neil Armstrong and Buzz Aldrin landed their "Eagle" craft on the lunar surface (with Michael Collins orbiting in the Command Module), and then flew safely home. Oh, and Melanie was born on April 19 - the day that 22 years later (on May 22) would change my life for the better. Sunrise in Boston occurred at 4:57 am that day, and sunset was at 6:31 pm, just as in 2018. The moon was five days old, that being a waxing crescent. * See the Length of Day Versus Day of Year graph I designed using data from the Old Farmer's Almanac. Melanie then created a counted cross-stitch picture of it, circa 1984. Listen to me, my dear lost children, and you shall become as confused as "Wrong-Way Corrigan" - the little man who thought he was flying to San Francisco and landed, across the Atlantic, in Ireland. My subjects are the four major props of our now whirling Space Age. The literature already accumulated on these would make a paper blanket three feet deep over the entire continent of North America. Any omissions are entirely intentional, and the honest purpose of this summary is to encourage such rare spirits as Ogden Nash, Harpo Marx, Bob Hope, and Frank Sullivan. Only such well-qualified men as these may emerge from studies of these subjects with a semblance of sanity. 1. Sonic Booms come from objects in space which travel faster than the speed of sound. Jet planes, for example, when they cross the sound barrier, boom like a thunder clap, and nowadays just about every householder is familiar with them. The extent of a boom may be measured in decibels - a unit of sound measure. Loud thunder measures 120 decibels - the equivalent of one-half pound per square foot of pressure. The measurement of a really strong sonic boom is about 140 decibels, or five pounds per square foot of pressure. 160 decibels, or 32 pounds pressure, will injure the human ear. Structural damage occurs only when 150-300 pounds per square foot of pressure is applied. However, 5 pounds per square foot (well within the possibilities of low-flying jets) will crack large window panes, loosen bric-a-brac, and aggravate plaster cracks. There are now seven different kinds of American planes capable of setting off such booms - two more (one the B58 which can really sound off big) will soon be operational, as will, on a not-too-distant day, the supersonic airliners. The sonic boom is with us to stay, a necessary part of American defense. To grumble about preparedness is to be ignorant as well as ornery. Another measure of the sonic boom is its frequency in cycles per second. Feeling the boom's vibrations of 5 or less cycles per second, any ordinary house with the vibrating capacity of 5-40 cycles (which most have) will want to vibrate much faster of its own accord than the sonic boom intends it shall. Thus we groundlings are led to believe, see, and feel our houses jumping around from these booms when, actually, they are not doing so any more than they would from the slamming of a screen door. They just want to, that is all, and that is what, in some unknown way, triggers our own imaginations into thinking they are Mr. Marx, the sonic boom is now all yours! II. Fallout is a general term applied to radioactive isotopes. These isotopes are of short, medium, and long lives - and are variously described in such terms as carbon 14, strontium 90, zirconium 95, niobium 95, cesium 137 and 144, ruthenium 103, and cerium 141. From overexposure to these, such threats to human being as bone cancer and genetic defects are not only possible but probable. The gamma radiation caused by relatively short-lived isotopes has a more immediate and direct effect on gonad tissue than does carbon 14, an isotope which lives some 8000 years. Both produce changes in the human hereditary material which we pass on to future generations. Civil defense experts offer no hope for those within the nearest few miles of a nuclear explosion. It is for this reason that the Atomic Energy Commission, in cooperation with the United States Weather Bureau, has established numerous test platforms all over this country to measure the fallout from our own and the Russian nuclear explosion tests. Although the latest results of these tests are, when released to the public, over a year old, it seems apparent that North America is accumulating, to a greater degree, and faster than any other region of the world, these deposits - especially strontium 90. As of October 1958, the westerly around-the-world winds since the first nuclear explosion in 1944 have left, between latitudes of 40-50 north, 46.9 millicuries per square mile of strontium 90 in the soil. The average found between 30-40 north was 32.G. United States average is 10-15 mc/mi2 higher than world average. Monthly total levels in the spring of 1959 of all gamma emitters reached between 4000 and 5000 mc/mi2. There is no method of measuring what quantity of gamma-emitting material is now held in the atmosphere, or just when and where a tornado or other weather phenomenon might force it down. It is enough, perhaps, to realize that each and every day, from the soil and our plants, and through the feeding of cows and other animals on this vegetation, our children and grandchildren are absorbing increasing quantities of these tissue-destroying gamma emitters into their bodies. The time is not yet, as some believe, for removal to land areas other than those between 30 and 60 latitude, north or south; but among those who are so doing, fallout dangers are more frequently being given as a reason. Given time, suitable defenses no doubt will be found. Filtering through ground, dried cow bones, for example, has been found to remove 75% of the strontium 90 from milk. This fallout and all its implications is no laughing matter. Still and all, The Mouse That Roared was not without its amusing side. Ogden Nash gives his answer to this on Page 78. III. The Satellites, until October 4, 1957, were all God- or Nature-made. The earth had one (the moon), and all except Neptune of the seven large planets had several. When the Russians Launched Sputnik I, a satellite of their own making, the earth could boast of having two - the moon and Sputnik I. Since that date quite a few earth satellites (including the first launched by the United States on January 31, 1958) have been placed in orbit. Earth satellites, not to be confused with rockets or missiles, are usually spherical. They spin about the earth beyond its atmosphere in an elliptical course dictated by the earth's gravity. Of a life limited to a few years, their size varies anywhere from a few pounds to several tons. Their scientific value lies chiefly in the instruments they carry. A Russian earth satellite, for example, was recently launched to travel around the moon first, send back photographs of the moon's dark side, never seen before by man, and thence to return to its course around the earth. 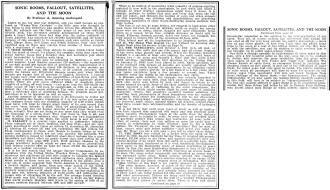 Some of the early satellites bore instruments which reported a belt of radiation in the outer atmosphere, the dangers from which might render flight in outer space by mankind impossible. Others, like America's so-called weather satellites, are reporting back photographs of cloud formations over the surface of the earth. Still others are instrumental, or will be, for discoveries relating to photography, solar batteries, television, telescopes, satellite recovery, radio relays, manned flights, air density, current rings, solar rays, cosmic rays, micrometeorites, and the density of hydrogen and ion. It is not likely that until some years of study as well as application have elapsed that mankind will enjoy any real practical satellitical benefits. Photographs taken of the earth from the distance satellites must, to remain in orbit, be away have not revealed much of anything smaller than oceans and continents. At some point or other, of course, their cost (ten million or more for each) may be viewed in relationship to value received; that is, for a billion dollars, Mr. Taypayer, do you want 100 satellites? But for now, at least, expect more and better satellites - and never you mind the cost. Mr. Hope, you are a rich man - you tell us about these things? IV. The Moon was visited by a rocket from the earth on September 13, 1959, Eastern Daylight Saving Time. It weighed 860 pounds, traveled 236,160 miles to get there, and marked mankind's first successful landing of an object from this earth on a celestial body. Such an accomplishment, bracketed as it is with satellitical developments, gives pause to the fascinating study of almost everything in space travel. In this, the most frightening department is that of the Intercontinental Ballistic Missile (or ICBM). 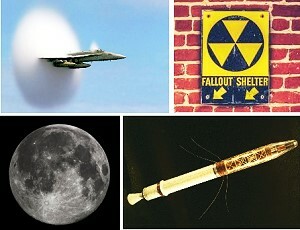 Carrying an atomic bomb in its nose, this space rocket supposedly can demolish an enemy target five thousand miles away. Radar screens around this country's borders may perhaps give fifteen minutes warning of an enemy ICBM on its way, and the attack stopped short of destination. But push-button warfare of this kind is not exactly pleasant to contemplate. The utter fantasy, however, of much of the rest of space travel study is a pleasant, even if equally unprofitable, exercise of the imagination. Astronauts, or men actually being groomed for travel in outer space, are being trained for this new experience by our own and other governments. Tickets are being sold for the first trip to the moon, and a fortune left by the will of a wealthy Frenchwoman awaits the first person to arrive there. There is even talk about interstellar migration as the solution to the over-population of our earth. Thus far, of course, nobody has discovered that human life can exist at all for very long outside the earth's atmosphere - much less on any other planet; or how even Uncle Sam can afford many trips to the moon at a cost of two billion dollars per trip. But here, as with the satellites, cost and its relation to value received just is not brought up in polite space-science circles. One finds a strange anomaly in explorations of outer space in that man, once a few hundred miles on his way, soon has to be confined in clothes and capsules far more restrictive than the great wide open spaces of one of New York's new "cigar box" taxicabs. The disease known as cabin fever, so commonly found in yachting and camping circles on this planet, is just one of the difficulties of space flight, for which some real cure must be found. The plastic uniforms or suits which all passengers will have to wear for months on end during space trips apparently will rule out much business from those darlings of the travel trade, - the honeymooners. The sexual relationships, if we may quote one human factors research engineer in this field, will have to be subject to "chemotherapeutic control." We find this concept difficult if space flight is to be considered pleasurable. But these things had better be left to Francis John Sullivan, who knows about such things as when oysters spawn - and Why.